Have a look at this spacious two bedroom, two bathroom beachfront condo at Inlet Reef, room 603. The open kitchen has an abundance of counter space and all the full size appliances, pots, pans, dishware, and silverware needed to prepare your favorite meal. There are two dining tables in the condo. One dining table seats 6, while the other dining table seats three. There is bar seating for two in the kitchen as well. The Living room has three plush chairs, a couch that doubles as a Queen Sofa Sleeper, a big screen HDTV, a Blu-Ray Player, a small table set for two, balcony access, and stunning views of the Gulf of Mexico. The Master Bedroom has a King bed, a flat screen HDTV, a DVD player, and balcony access. The Master Bathroom has a makeup area with its own sink, an additional separate sink, and a bathtub/shower combination. The Guest Bedroom has a Queen bed, a flat screen HDTV, and a DVD player. The Guest Bathroom has a bathtub/shower combination. The condo sleeps six guests in comfort and ease. Easily, the best part of the condo is the balcony and its views. You are at the top floor of the Inlet Reef building, so the views from the hexagonal shaped balcony are absolutely breathtaking. The balcony comes with a wet bar and an outside dining table. Another amenities include complimentary beach service when in season, a full size washer and dryer, and complimentary high speed wireless internet access. 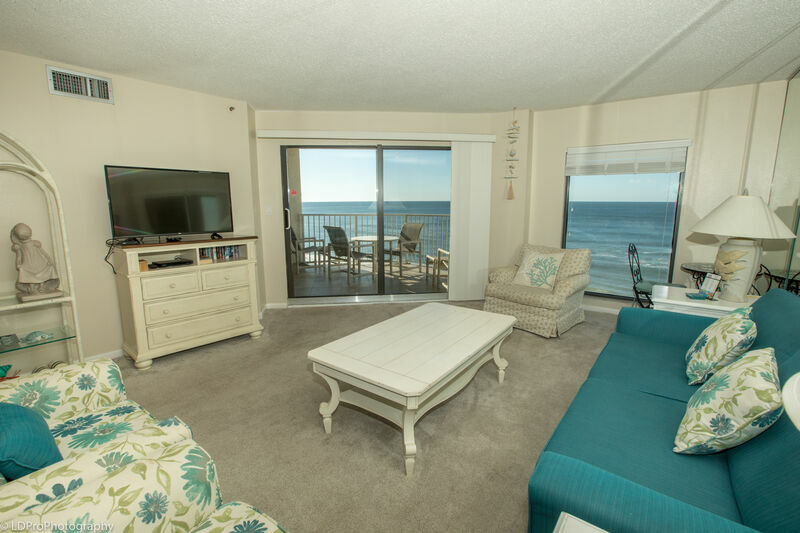 Do not delay in booking this condo so that you may experience Destin at its finest! The staff on the property were very friendly and accommodating. The property was well kept and the appearance was nice. Enjoyed our stay and looking forward to staying again. Had a great time in Destin. Our condo had amazing beachfront views. Would definitely return. Called the office to notify them of our late check in and had everything when we arrived. Condo offered beach service which was a plus. Only complaint was how close the chairs were set up and how even when your neighbors were whispering you could still hear their conversations. We had a great time but I really wish we could have set up our tent we didn't know the cops were going to be called because of a tent on the beach lol keeping it classy, don't bring your tent to this place they'll arrest you! !